Michelle Parks gets ready to make some GPS measurements on Santorini. 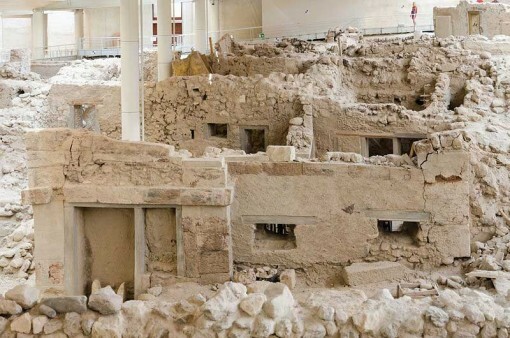 Will Ancient Akrotiri Face Another Massive Eruption? The ancient Minoan city of Akrotiri was destroyed by a massive eruption over 3,000 years ago. Will it happen again soon to the excavated remains and the modern town? Scientists uncover some possible signs. Akrtoiri is well known to archaeologists as the excavation site of a remarkably well-preserved Minoan Bronze Age settlement that was buried by the massive and widespread Theran eruption in the middle of the second millennium BC. The eruption was one of the largest volcanic events in recorded history. It devastated the island of Thera (also called Santorini), which included the settlement at Akrotiri, in addition to communities and agricultural areas on nearby islands and on the coast of Crete. Like the Roman ruins of Pompeii much later in 79 A.D., it’s buildings and human artifacts were exceptionally preserved under the super-heated, yet protective, covering of the volcano’s ashfall. Frescoes, pottery, furniture, advanced drainage systems and three-story buildings have been discovered at the site through excavations conducted by Spyridon Marinatos beginning in 1967. Some historians suggest that this settlement, as well as the volcanic disaster, was the inspiration for Plato’s writing about Atlantis. 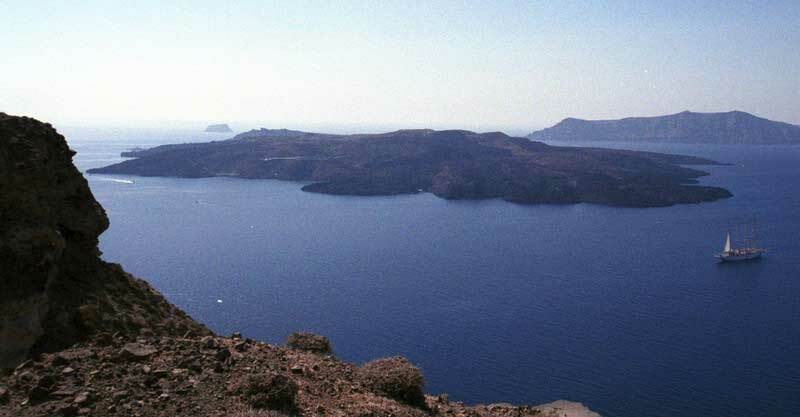 Now, a new survey suggests that a chamber of molten rock beneath Santorini’s volcano has expanded 10-20 million cubic metres – up to 15 times the size of London’s Olympic Stadium – between January 2011 and April 2012. The growth of this ‘balloon’ of magma has seen the surface of the island rise 8-14 centimetres during this period, a team led by Oxford University scientists has found. The results come from an expedition, funded by the UK’s Natural Environment Research Council, which used satellite radar images and Global Positioning System receivers (GPS) that can detect movements of the Earth’s surface of just a few millimetres. In January 2011, a series of small earthquakes began beneath the islands of Santorini. Most were so small they could only be detected with sensitive seismometers but it was the first sign of activity beneath the volcano to be detected for 25 years. Following the earthquakes Michelle Parks, an Oxford University DPhil student, spotted signs of movement of the Earth’s surface on Santorini in satellite radar images. Oxford University undergraduate students then helped researchers complete a new survey of the island. 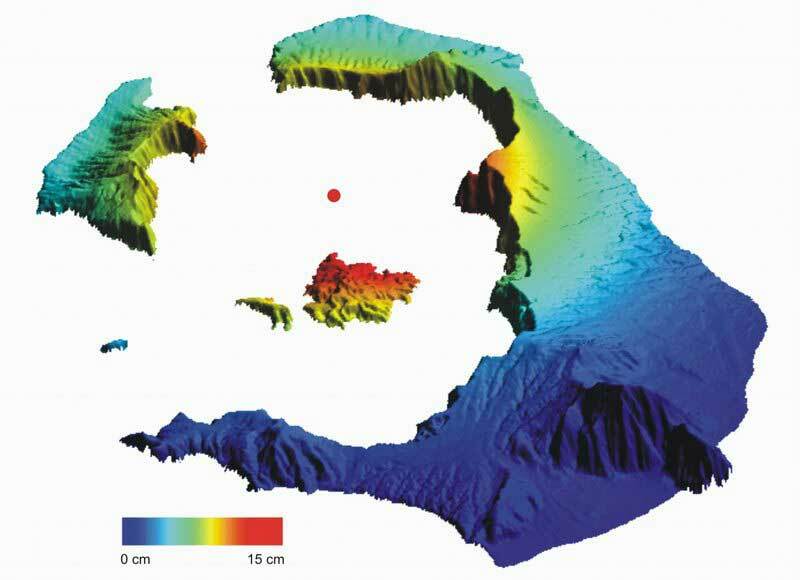 The team calculate that the amount of molten rock that has arrived beneath Santorini in the past year is the equivalent of about 10-20 years growth of the volcano. But this does not mean that an eruption is about to happen: in fact the rate of earthquake activity has dropped off in the past few months. The report of this research, entitled ‘Evolution of Santorini Volcano dominated by episodic and rapid fluxes of melt from depth’, is published in the journal Nature Geosience.